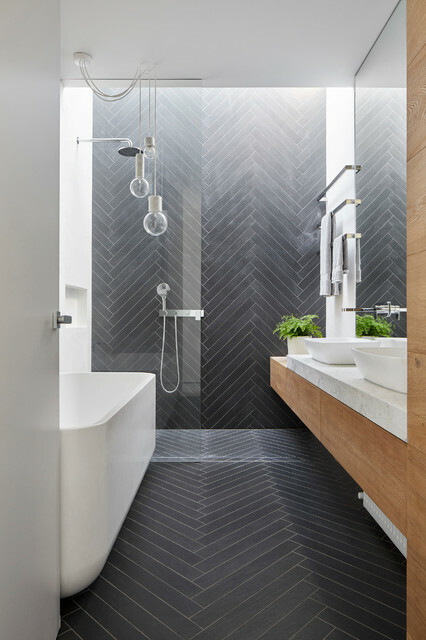 Dark floor tiles laid in a herringbone pattern wrap up the shower wall and into the skylight over the shower. Timber joinery , marble benchtop, full height mirror and Venetian plaster add contrast and warmth to the bathroom. Siow Yuen Wong added this to Is Marble Right for Your Bathroom? The advantages of marbleMarble is very easy to work with. It is a softer stone that can be milled, machined and tumbled, which means it can have multiple uses. Marble can be used as full slabs of marble for walls, counters and flooring, and then as smaller pieces for cornice and door casing details. Too dark, but like the herring bone style on both floor and extended into shower. Maybe same shape tile, but diff colour in the shower? Dark chevron tiles - shower? Toilet?